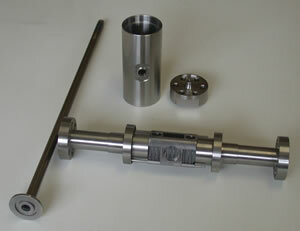 Scientific and technological fusion research requires the development of innovative instruments and techniques, which can often be implemented in industrial applications and in other scientific fields. A gas electron multiplier (GEM) detector for x-ray imaging, developed for measuring FTU thermonuclear plasmas, can be implemented in the diagnostics of plasmas produced by lasers or x rays , in x-ray astronomy, x-ray microscopy (also with time and energy resolution) and in x-ray photolithography of semiconductors and to carry out non-destructive tests on materials. 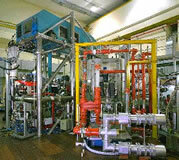 Apparatus for detecting inert gases in complex gaseous mixtures can be applied in environmental research, in the analysis of the isotopic ratio 3He/4He, in seawater and groundwater, in volcanology and in the prevention of disasters resulting from seismic or volcanic events. 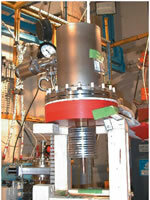 An intense, transportable neutron, x-ray and gamma-ray source of the plasma focus type has been developed for various applications ranging from the identification of elements in materials and the production of radio-isotopes for use in medicine to lithography and antipersonnel-mine detection. 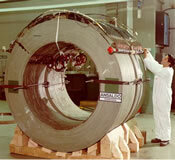 With regard to Superconductivity the Fusion Programme has played an important role for Italian industry in the field of materials and/or apparatus for large superconducting magnets and has promoted, by transferring to industry the knowledge acquired, the development of technologies for fabricating superconducting cables and tapes and techniques for winding intrinsically fragile materials. Apart from the development of large superconducting magnets for fusion and non-fusion applications, superconductivity, both at low and at high temperature, can be applied in the fields of energy transport/distribution and electronics, where the potentials for its use are expected to shortly become concrete. materials Composite materials in a ceramic matrix, e.g. SiC/SiC, developed as structural materials for the fusion reactor, can be used in the aerospace industry, in engine and burner parts and in high-temperature heat exchangers. A device developed for analysing samples of irradiated material carries out characterisation of metallic materials by a non-destructive and practically non-invasive method on small-dimension samples. Palladium alloy membranes Innovative joining technology Palladium alloy membranes that are completely hydrogen-selective and catalytic membrane reactors, used to separate hydrogen in the fuel cycle of a fusion reactor, can be used in molecular reforming processes in the petrochemical and chemical industries and in the automobile industry. An innovative joining technology, developed for particular components of the fusion reactor, is used for complex, hot, solid-state, simultaneous diffusion welding of co-axial objects, on their cylindrical contact surface. The radiofrequency systems for heating the plasma and generating the current in FTU use non-conventional components and high-frequency high-power microwave sources (e.g. : gyrotrons). Developed in Russia initially for fusion applications, gyrotrons have always been used in the materials industry for quick, focussed and efficient heat treatment (by drying, fusion, joining, annealing, sintering, curing and coating) of materials with low heat conductivity (polymers, glass, ceramics, crystal semiconductors). A high-quality system for remote inspection and ranging, developed for remote viewing and inspection of plasma-facing components in the fusion reactor, accurately reconstructs, in the absence of illumination, the image and distance of objects by means of a laser beam. The system can be implemented in all the fields requiring inspection and detection in hostile or risky environments, e.g., for civil defence purposes and archaeological and geological investigations. 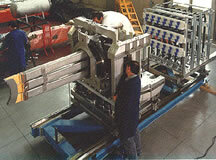 developped for large fusion experiments, can also be used to make high precision survey of large plants. 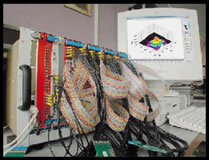 A multi-connector for electrical and mechanical interfaces has been developed to realise tube connections for actuators and cooling fluids, gas, and the electric cables between the microwave antennas (Ion Cyclotron Resonance Heating) and the automatic power transfer and load (APTL) controls.